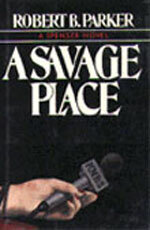 adapted as "A Savage Place"
Synopsis: Boston TV reporter Candy Sloan has eyes the color of cornflowers and legs that stretch all the way to heaven. She also has somebody threatening to rearrange her lovely face if she keeps on snooping into charges of Hollywood racketeering. Spenser's job is to keep Candy healthy until she breaks the biggest story of her career. 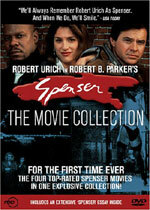 But her star witness has just bowed out with three bullets in his chest, two tough guys have doubled up to test Spenser's skill with his fists, and Candy is about to use her own sweet body as live bait in a deadly romantic game -- a game that may cost Spenser his life.